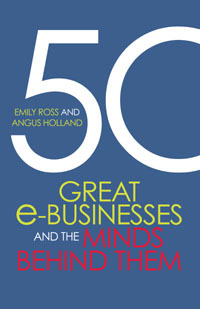 Last night we took ourselves off to the launch of a new book ’50 Great e-Businesses and the Minds Behind Them’ – because Fiona and I are in it – they’ve written us up, with our story of Arts Hub and its sale in 2006 as one of the 50 businesses. We were interviewed by Emily Ross, the co-author with her partner in life and crime Angus Holland, a few months ago. It was a pleasant and professional experience, Emily was a delight to deal with, and made sure she followed up with fact checking emails afterwards. The launch was held at the Avenue Book Store, our absolute favourite bookshop – we’re regulars, I think we probably own shares in the shop now given the quantity of books we’re purchased over the years. You can read more about the book, and order it, from the publisher’s web site. It’s not available yet on Amazon as far as I can see.